The Victoria and Albert (V&A) Museum of London is opening its doors to 3D Tune-In on Wednesday 18th April 2018. The museum will host the 3D Tune-In final public event since the project commenced in May 2015. Hearing Futures is being organised by the 3D Tune-In team in partnership with the V&A Digital Media department. The aim of this project, supported by the EC H2020 ICT programme, is to utilise Virtual Reality and 3D gaming technologies to support hearing impaired users and enable them to better understand how to use their hearing aids. We are thrilled to be able to share our final games with the public. The V&A is the world’s leading museum of art and design, housing some of the greatest resources for the study of architecture, furniture, photography, sculpture, painting, jewellery, glass, ceramics, book arts, theatre and performance. 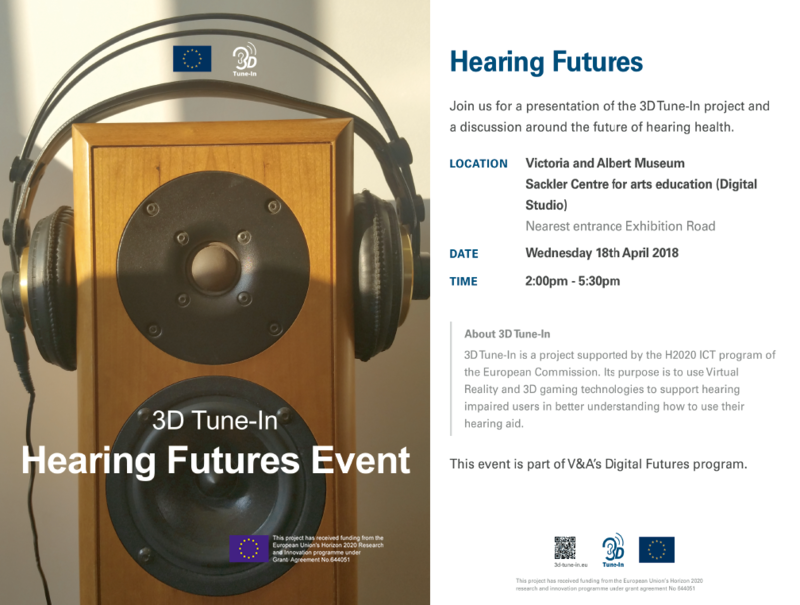 For this Hearing Futures event, 3D Tune-In is working in collaboration with the Head of program for the V&A Digital Media department, Irini Papadimitriou. Digital Futures is an open platform for displaying and discussing work by researchers, artists, designers, companies and other professionals working with art, technology, design, science and beyond. It is also a networking event, bringing together people from different backgrounds and disciplines with a view to generating future collaborations. The event that will take place from 2.00-5:30 pm, will include demonstrations of the 3D Tune-In applications and an open-debate about the future of hearing loss. The debate will be chaired by the project’s leader Lorenzo Picinali and attended by a panel and audience from a variety of professions including artists, audiologists and game developers and end users. All events are free and will be held at the ‘Digital Studio of the Sackler Centre for arts education’ which you can access from the recently opened entrance of the museum on Exhibition Road but if you want to secure your place at the open discussion, please email digitalprogrammes@vam.ac.uk. The afternoon will conclude with a visit to the Design Engineering laboratory and reception at Imperial College.